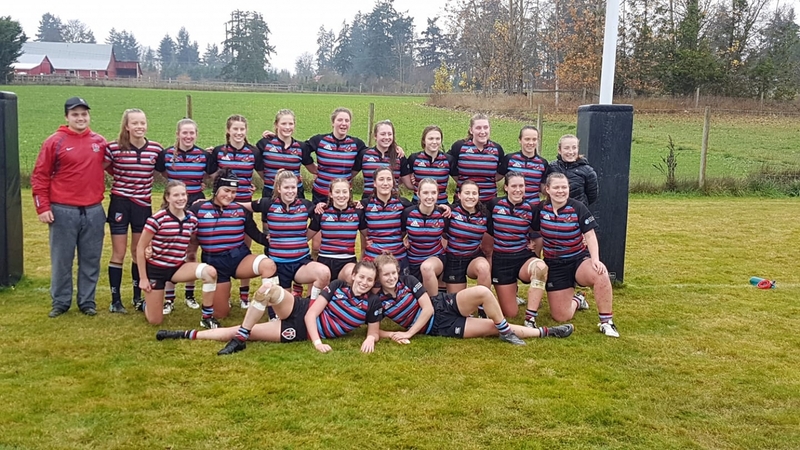 The U19 Final last Sunday was a rematch of the previous weekend’s road trip for the CW team when they travelled to Comox. With the wetter conditions, the going was to favour the North Island style of game. As the game progressed, it was clearly evident that the CW coaching team had put its stamp on this team as the variety of attack was to prove to be too strong for the Northerners. Despite scoring first, CW was under a fair amount of pressure from the North Island team with strong ball possession and running by their strong forward pack. The possession and forward play soon resulted in a try for the North Islanders. This seemed to wake up the CW team who started a series of phases with attacks through their forwards (notable were Zoe Williams - a Westshore member, Marina Skakun and Morgan Warner) and then the ball was moved into the midfield with some good running by Britt Gardiner and Kenzi Parish. CW tries then began to flow as a result of their width of attack. The CW back row featured prominently in this game with some skill runs and offloads from Hannah Scherr, and Kalina Lang. Speed was a great weapon for the team on the day with speedy distribution from half-back, Ella O’Regan and some calm decision making from Emily Parker to command the back line. Tries came fast and often from CW, with Maelle Reed scoring a hat-trick from the outside and Britt Gardiner contributing a brace. The forwards contributed tries with hard running and good speed shown by Marina Skakun, and Chloe Hill-Huse. As mentioned, the backrow players were on fire, with all three players contributing tries to the cause. Emily Parker had a great day with the boot, converting seven tries, some from out wide. Substitutions proved to have an impact with Libby Hogg (JBAA), showing great skill and a nose for the gap on many occasions with one long run that almost resulted in a try. It was also good to see some of the younger U16 players get a run, Jorja Cook making a long run and Jesse Knaggs and Rylee Phillips (JBAA) getting on the field to play up with the U19s. So, CW were worthy victors and will now take on Abbotsford in a repeat of last year’s final for the B.C. U19 title. The match kicks off at 1:45 p.m., this coming Sunday at Herd Rd. Thanks to the hosts, Cowichan RFC for the day and to the match officials. 'onyas, Ollie and Lauren and all the players. U16'S HAVING FUN AFTER THEIR MATCH. It is indeed, a measure of the growth of the girl’s game to see two clear divisions playing in playoffs. It was only a few short years ago that these divisions were often merged to make up teams. Full credit to the volunteers in each of the clubs across the island to build these programs. U12 Girls also in Cowichan, having a lark. CW U19’s are slated to play JBAA for the VIRU Title next Sunday after winning their semi-final. We wish all involved the best of luck and offer an ‘onya for a job well done, with a quite reminder that it’s not finished yet!! Noted last Friday evening at Centennial Stadium, refereeing Sevens games at the interval of the Vikes match – CW’s Max Freund and Chloe Hill-Huse. Chloe went into action on Saturday at Cowichan for the U19’s as did Max with the Men’s islanders. Chloe will lead her troops in the B.C. Final this weekend. Chloe in her preferred action! With NSWT and NSMT Sevens in action in Dubai this weekend it provides a perfect segue into a deal for youth for the Vancouver Sevens in 2019. Through the BCRU this exclusive offer for BC Rugby Mini and Junior Members allows you to purchase a GA Tournament Pass for the HSBC Canada Sevens Vancouver Tournament. Taking place at BC Place on Saturday, March 9 and Sunday, March 10, the GA Tournament Pass gives your Mini or Junior Rugby Player access for both days of action, into any non-reserved seating area on either level 200 or 400. Children aged 12 years and under must be accompanied by a guardian. You can take advantage of this offer HERE.